achene - a small dry fruit. 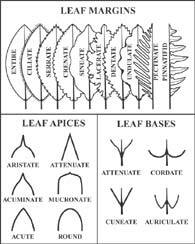 acuminate - tapering to a point. acute - sharply pointed but not drawn out. adpressed - lying flat for the length of the organ. adventitious - applied to roots, those which do not arise from the radicle but from another part of the plant, usually the stem. annual - a plant which completes its life cycle within a year. anther - the part of the stamen which contains the pollen. apiculate - tipped with an apiculus, a short, sharp point. appressed - lying close to. auriculate - having a small projecting lobe (and auricle) at the base of an organ. awn - a stiff hairy bristle. axil - the angle between the axis (stem or branch) and the part arising from it (leaf or bract). axillary - growing in an axil. basal - located at the base of the plant or of an organ of the plant. biennial - a plant that completes its full life-cycle in two years. bifid - divided into two parts. bilabiate - having two lips. bract - a modified leaf associated with the flowering part of the plant. callus - swollen nodes of the central stem of a grass. calyx - the outer series of leaf-like segments of the flower which is usually green in color, it may be large and colorful, present or absent.It encloses the flower while it is still a bud. capitate - applied to an inflorescence in which the flowers form a head. capsule - a dry, dehiscent fruit. caudex - the stem of a plant. ciliate - fringed with hairs, as on the margin of the corolla lobes in some of the stapelieae. clavate - club-shaped, thickened towards the top. corona - in the stapelieae, a crown-like portion of the staminal column, usually with the inner and outer lobes. crenate - notched or scalloped. crisped - with a curled or twisted edge. cyme - an inflorescence in which the lateral axis grows more strongly than the main axis. deciduous - falling off or shed at a specific season or stage of growth. decumbent - laying or growing on the ground but the tips are erect or growing upright. elliptic - having a shape of a flattened circle. entire - without toothing, a smooth margin. filament - the stalk of an anther. glabrous - smooth without any pubescence. glaucous - sea-green or covered in bloom. habit - general appearance of the plant. hirsute - hairy, with long distinct hairs. hispid - with rough hairs or bristles. 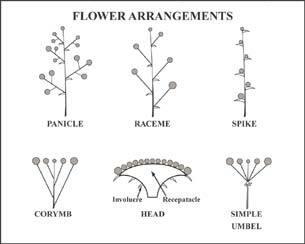 inflorescence - a special branch-system which bears flowers. internode - portion of the stem between two nodes. involucre - a ring of bracts that surround one to many flowers. keel - a longitudinal ridge, at the back of the leaf. laciniate - cut into narrow lobes. lanceolate - lance-shaped, tapering from a broad base to the apex. lax - loose or limp, not densely arranged. linear - narrow with nearly parallel sides. node - the part of the stem that gives rise to the leaf and bud. obtuse - with a blunt or rounded tip. orbicular - flat with a circular outline, disc-like. ovary - the part of the pistil which contains the ovules (immature fruit). ovate - egg-shaped, usually with reference to two dimensions. 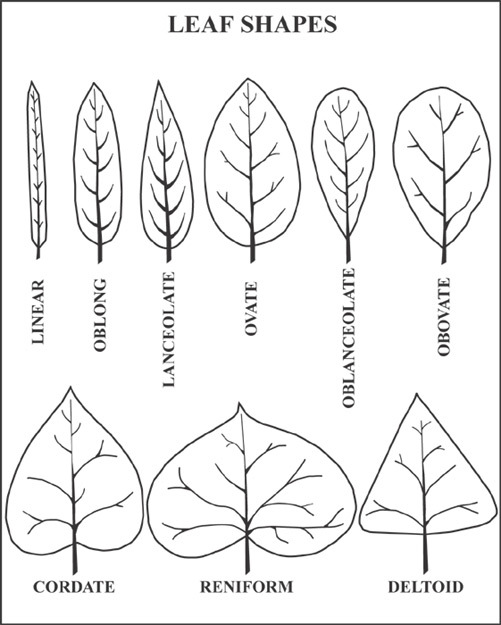 palmate - flat and lobed. panicle - a compound inflorescence in which the main axis bears lateral racemes or spikes. papillose - covered with papillae. pedicel - the stalk of the flower. peduncle - the axis from which the flower pedicel arises. peltate - with the petiole attached to the lower surface of the leaf blade. perennial - a plant that continues its life cycle for more than two years. perianth - the two outer whorls of the Angiosperm flower; commonly used when the calyx and the corolla are not readily distinguishable (as in monocotyledons). periginia - a sac like bract that covers that fruit in the sedge genus Carex. petiole - the stalks of the leaf. pinnatifid - a pinnately parted leaf, dividing almost to the midrib. procumbent - trailing on the ground without rooting. prostate - flat on the ground. pubescent - covered with short soft hairs. raceme - an inflorescence with a single axis bearing pedicellate flowers. reflexed - abruptly bent backwards. reticulate - having the appearance of a network. revolute - rolled back at the margin. rhizome - a prostrate or underground stem which generally grows horizontally. rosette - used to describe a cluster of densely spiralled leaves. rugose - covered with wrinkles. scabrous - rough to the touch. serrated - with teeth on the margin. serrulate - with minute teeth on the margin. sessile - without a stalk. sinuate - deeply wave (margin), tortuous. spathulate - also written spatulate, shaped like a spatula with the distal end broad. 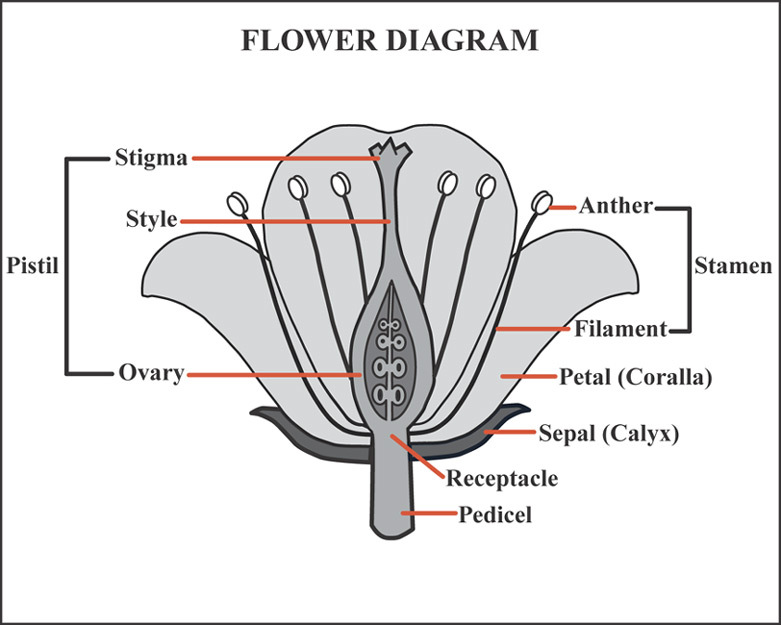 stamen - the pollen-bearing male element of the flower. staminode - a sterile or abortive stamen. stigma - the part of the stigma receptive to pollen. stipule - refers to the small appendages at the base of the leaf. stolon - a runner or any basal branch which roots. stoma - an aperture in the epidermis, plural stomata. style - the part of the pistil between the stigma and ovary. taxon - the taxonomic group of plants of any rank. terete - circular in transverse section. trichome - a hair-like outgrowth of the epidermis. trifid - cleft into three pieces. tripartite - consisting of three parts. truncate - cut off as though shortened. tubercle - a knob-like projection on the stem or leaf. umbel - an inflorescence of pedicellate flowers of almost equal length arising from the apex of the peduncle. urceolate - shaped like a jug or pitcher. valve - one of the portions into which a capsule separates when ripe. villose or villous - covered with long, fine, soft hairs. whorl - a circle of leaves, sepals, stames or other organs around an axis.